Find your acomodation in Bucarest. 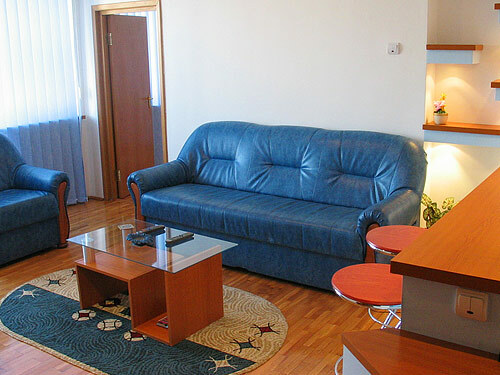 EastComfort dispose of 50 quality apartments in Bucharest, sorted by price, number of guests or by our recommendations. 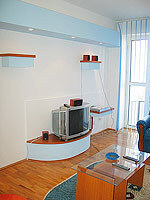 View our list of apartments and choose one. 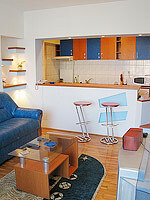 The flat is an ideal short-term rental (for both leisure or corporate travel). Cozy, laminate floored, it is made up of a wide sitting room, furnished with a blue leather sofa and armchair, glass coffee table, the minimal effective decor being its feature: plaster finishings, the minibar and spotlights, high-techs (cable TV set, air conditioning). 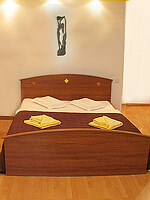 The bedrooms are simply furnished with full sized beds, wardrobes, large windows, an intimate home far from home. The bathroom has shower, bath amenities. 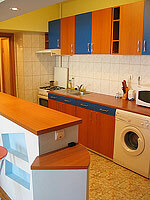 The separate kitchen is equipped with devices, ustensils, furniture, the bar table could be used also as a dine-in nook. One of the most soght after street of Bucharest, as it offers everything: entertainment (plenty of night clubs, bars, pubs, discos), elegant or budget-conscious dinning places, cultural centres (theatre, art galleries, sightseeing locations), famous hotels (Hilton, Intercontinental, Lido, Ambasador), commercial quarters (banks, firms, business activities sites, stores or markets, Amzei Market is famous for its ever fresh fruits), all wait to be enjoyed!